Remix Culture and the Literary Mashup – Alluvium Journal. 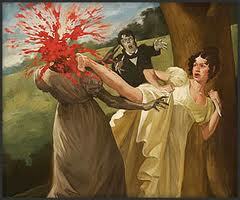 2009 saw the release of the first mainstream literary mashup – Pride and Prejudice and Zombies by Seth Graeme-Smith. This particular book has produced a prequel (Pride and Prejudice and Zombies: Dawn of the Dreadfuls, published in 2010) and a sequel (Pride and Prejudice and Zombies: Dreadfully Ever After, published in 2011), effectively turning Austen’s classic into a commercialised franchise opportunity. All of this raises the question as to whether this particular genre of fiction can be classed as serious, or whether it is just another excuse to create a profit. Indeed, some sources have stated that ‘Quirk Books is planning to capitalise on the popularity of the genre’ (Flood par. 6). In this article, I am taking the term “literary mashup” to refer to a piece of fiction which has combined with a completely different literary genre to create a new narrative – essentially a hybrid text. Also check out Kirby Ferguson’s video series, Everything Is A Remix. This entry was posted in Alluvium, Books and publishing and tagged Alluvium Journal, Jacob Murphy, Jane Austen, Kirby Ferguson, Lincoln University, remix culture, Remix Culture and Literary Mashups, zombies by Michael Blackburn. Bookmark the permalink.